Velvet Paw Creations: DominoART's 12 Days of Xmas Festival! 3 prizes are up for grabs so on Day 12 there will be an inlinkz collection of all the projects and you will get to vote for your 3 favourites! I know this is a super busy time of year for you all so voting will remain open until Dec 20 to give you plenty of time to stop by and peruse all the awesome projects and cast your votes! The winners will be announced on Dec 22! 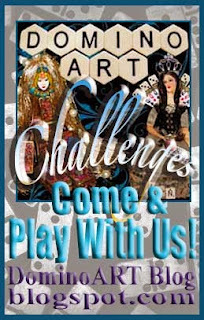 Just a quickie reminder that DominoART's last challenge of the year is staying open longer too so I hope you'll come and play with us ;0) Click the badge above for all the deets! I had planned to play in the Smeared and Smudged Forum's 12 Days of Creepmas again this year but unfortunately I just didn't get my projects pre-made before I'm off on vacay! I hope you will get chance to hop along with the Jolly Bloggers! Click the banner below to start your hopping!